Villa Tommy is a luxurious, beautifully appointed villa in an intimate setting, within walking distance from the lively village center of Lajares. The private pool is electrically heated for year round comfort. The accommodation offers a spacious living room and kitchen/diner, 2 ( optional 3)bedrooms and a large bathroom with double sinks and a spacious shower. A double sliding door gives entrance to a large covered terrace for those breakfasts in the morning sun. . The village of Lajares has all the amenities necessary for your stay, with a supermarket, restaurants, bakery, pharmacy, and cashpoint. It is just 5 km from the beautiful beaches and many restaurants of El Cotillo and ten minutes drive from the lively town of Corralejo. The setting of the villa is very private and quiet. Sports equipment like mountainbikes and surfboards are for rent at the property. Hi, I'm Dave. I have been living on this magical island for 13 years and I still love this place. When I'm not working as a freelance captain I enjoy surfing, windsurfing and fishing. I like to hear from my guests in the villa and on the island! I hope to see you sometime in this particular part of the world. I got this property because of the vicinity of all the great beaches. The village of Lajares itself is a small lively place with a couple of excellent coffeebars, shops and restaurants. I also like the lack of artificial lighting and thus the starry nights around here. Electrically heated pool, Cul de sac, no passing traffic or persons. Jacuzzi Great views Safe for kids, astroturf around the pool Privacy. 1 bathroom with double sink and two person shower head. 1 optional bathroom on the second floor. Timber for the fireplace can be purchased in the local hardware store. Lounge with sitting area, coffee table, 42" flatscreenTV with Home cinema/DVD, large selection of films, stereosystem, PlayStation 3 with selection of games. Dining room sits 6 people. Fast Wifi internet connection, fireplace. Cooker, hob, fridge/freezer, coffee machine, oven, dishwasher, microwave, kettle, plenty of crockery and cutlery. Bbq on the terrace. Bbq available. Both on gas and charcoal. Smart tv for your Netflix addiction. It-s possible to book a boat trip with me when I am on the island. I have a Quicksilver 630WA speedboat and I do trips to Lanzarote and Lobos as well as snorkeling and wakeboarding. Half day 160 eu. rental of surf, windsurf, kitesurf material is provided. Windsurf equipment full set 25 euros a day. surfboards 10 euros a day, kitesurf set 25 euros a day. There are several golf courses on the island. Many people take walks to the volcano behind the villa (No worries, it's dormant!) cycle paths to Corralejo and Cotillo and several tennis courts in town. Notes on accommodation: . There is an extra fee for the optional use of the yacuzzi for 85 euros a week. Outside: 8 person yacuzzi, dinner table, sofa, lounge table, two person hammock, BBQ. Bicycles are there free to use. The astroturf around the 8 x 4 meter private electrically heated pool year round provides a perfect playground for kids or just a place to put your beach towel down and sunbath. There's toys around for the kids to play with. Cleaning / Towels / Linen / Maid service: A package of linen and towels is provided for free. Other: The terrace features two loungechairs, a double hammock, a dinner table for 6 a sofa an 8 person yacuzzi and a gas bbq or charcoal on demand. great villa. pool was great . our 10 year old triplets loved it. great base to explore. the villa had everything you need and dave was very helpful. would definitely recommend and hope to come back. Lovely property in a good location. We stayed at the house during early January 2018 and had a wonderful stay. We stayed with our 3 year old boy and 11 month old Baby who slept in the provided cot in our room - he slept really well. The owner was really nice and hospitable and was always available if we needed him. Dave lives in the house next door, but we hardly saw him whilst we were there - the house is lovely and private and has fantastic mountain views. It’s only a ten minute walk to the nearest village which has an excellent supermarket with similar to UK prices. There’s also a few nice restaurants there too and a park. It’s only a short 15 minute drive to Corralejo plus the amazing Sand Dunes and was about 35 minutes drive to the airport, so you will need a hire car. The house has everything you need, including loads of towels, pots and pans, bedding, gas cooker, hob, satellite TV and even a wireless Bluetooth speaker for chilling by the pool. We only went in the pool twice as it was only around 20 degrees most days we were there. We did however pay the extra to use the hot tub for the two weeks which was a must, we used it often and it stayed lovely and warm whenever we went in it. My wife’s parents also stayed in the room above the main house for a week whilst we were there, they also really enjoyed their stay. The house is in a quiet road and is in a gated area. Overall a wonderful stay in a good location. Perfect ! The Harbron's from Surrey. We were a group of six adults comprising of family and friends who had booked Villa Tommy for three weeks. The local town of Lajares although small was compelling and we all spent a number of evenings sampling the great little restaurants and bars, which were mostly frequented with locals but who made us very welcome. 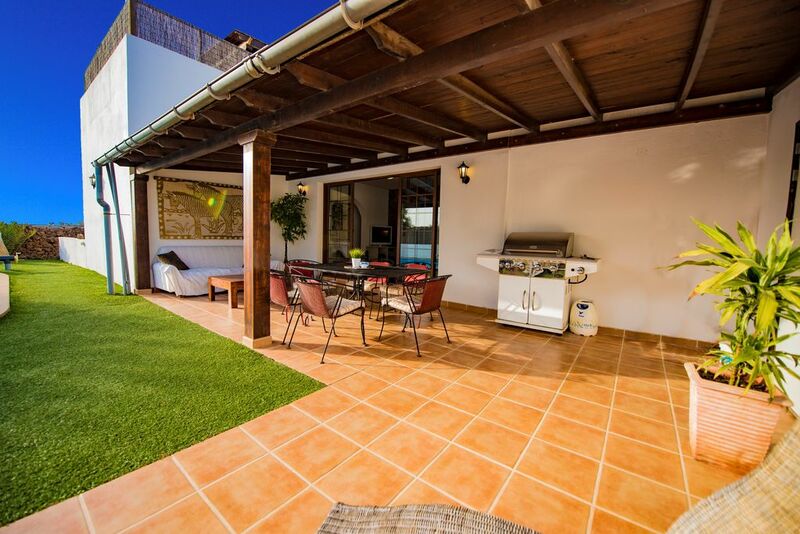 Villa Tommy is situated between El Cotillo, which has such beautiful beaches and excellent restaurants for a late lunch or dinner; and the main resort of Corralejo which is much bigger and busy, but worth a visit to shop and walk around the bars and restaurants. Villa Tommy was perfect for us, Dave the owner, has given careful thought to all that any of his guests could want....we spent a number of evenings just chilling in the garden, bbq and enjoying the warm evenings and peace, often finishing off in the hot tub with a glass of wine looking at the stars....The villa is comfortable but not overly luxurious but all of us had such a great stay. Dave, although he lives next door is not intrusive but is readily available to assist with any questions or suggestions of places to visit. A car is a must to get around although we did walk into Lajares a number of times. There is a brilliant fairly new supermarket locally which will supply everything you could possibly need for your stay, as well as a Bakery which supplied our lunches when we went off to the beach. The weather during our stay was perfect and many afternoons were spent back at the villa enjoying the pool and tranquility of the location. There was the occasional visit by Tommy, Dave's Labrador, who was interested in the latest guests and was rather partial to a 'biscuit'. The house “Casa Tommy” is located in a nice peaceful village called Lajares. The village is a pleasant 10 to 15 minute drive from Corralejo on the East coast and the same to El Cotillo. The house is right on the edge of the village with beautiful panoramic views and far enough away from any noise the village could make. There is a bar within a 5 minute walk and the village itself is only a 10 minute walk from the house where you will find a well-stocked Supermarket, many bars and Restaurant’s. The village has a small local Market on a Saturday in the town square and just behind that is a nice little play park for younger children. The house is very well maintained and looked after. The BBQ was very well used as was the pool which was a great size. The house is a 30 to 40 minute drive from the airport and Dave, the owner sent some directions which were perfect. Dave, the owner is a very welcoming and friendly guy who can give you lots of tips on what to do and where to go which was very useful. We spent the vast majority of our holiday at the house as we have a son of 3 and a half years. Dave supplied toys for him to play with and we also had a fantastic collection of DVD’s and books to chill out with in the evening over a nice glass of local wine. We would really recommend this villa and will certainly be returning at some point. Please don’t feel afraid to contact Dave he gave us lots of tips even before arriving and his dog “Tommy” was a favourite with my son. THANKYOU so much for helping us a brilliant holiday. Lajares is a lively bohemian type village with several shops, restaurants and bars. People mostly like to hike, bike or surf and i rent out all kinds of sports equipment as well. I do boat trips to Lanzarote and Lobos with my guests myself when I'm on the island so feel free to inquire about that. The north shore beaches are at 5 miles or a 10 minute drive. Cotillo beach is 15 minutes away as are the Corralejo beaches. The airport is 40 minutes away. Corralejo and Cotillo are both about 10 minutes away by car. The village of Lajares is a lively little place with a number of small restaurants, a great French and English bakery and a good supermarket. There are several bars and surfboard hire is available. Additional fee for optional yacuzzi is 85 euros a week.